The designers of OESH shoes say they have a "disruptive" technology with a midsole that is unlike any other running or walking shoe. They use carbon fiber cantilevers in the midsole to compress and release at the correct time during a stride. 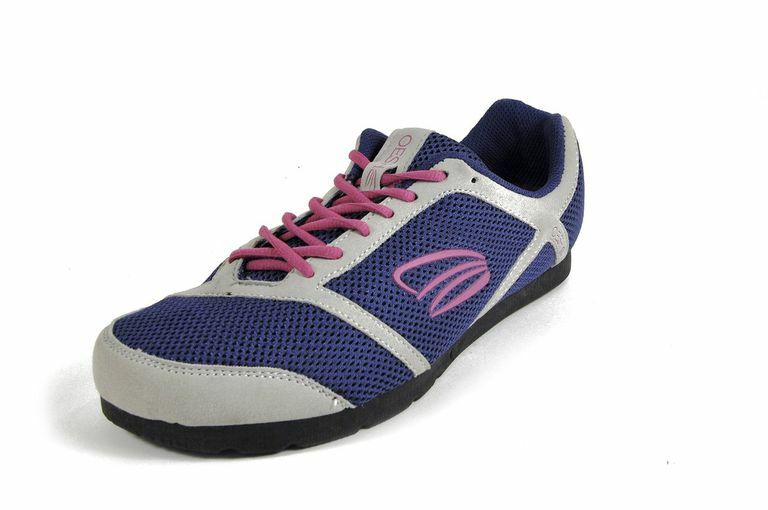 They are an excellent comfort shoe for all-day wear and as a fitness walking shoe for treadmill or outdoors walking. The name itself, OESH, is SHOE "upside down and inside out" to signify the unique technology. The shoe design comes from Dr. Casey Kerrigan and her colleagues in material sciences at the University of Virginia mechanical and aerospace engineering department. She is a published author of peer-reviewed research papers in the kinetics of running and walking. The theory behind OESH shoes is that the traditional designs of the midsole of athletic shoes are all wrong. They say that the foam, gel, air insoles and other materials used in most athletic shoes "give" at the wrong point of the stride when your foot first impacts the ground. OESH shoes have carbon fiber cantilevers in the heel and forefoot to give the desired compression and release during your stride at the time your weight is fully planted on your foot, not beforehand. They believe this protects against the stresses that might lead to knee osteoarthritis, plantar fasciitis, shin splints, and stress fractures. The designers also think this shoe eliminates the need for orthotics. It truly is a disruptive concept that goes against the mainstream of thought in correcting overpronation with motion control shoes and custom orthotics. The shoe doesn't have an unusual appearance. It looks like a walking or comfort shoe. The shoe is not stiff. You can bend it at the toe and twist it. Walkers don't need a built-up heel, yet many running shoes have a significantly built-up heel to provide stability for runners who land on their forefoot or midfoot. Walkers are supposed to plant their heel first. OESH shoes truly have a zero drop between heel and forefoot, which should allow for a better gait by walkers. The OESH La Vida v2.0 is a minimalist shoe unlike any other. Start with the fact that they are designed for women, to match the shape of a woman's foot vs. a man's. This isn't just a pink shoe. The entire structure of the shoe is revolutionary. The name itself, OESH, is SHOE "upside down and inside out." to signify the unique technology. Dr. D. Casey Kerrigan and her colleagues have been imaging and researching how the foot, leg, and body move. While big shoe companies have a lot invested in their current production methods, OESH can start from scratch to build a shoe that she believes will better prevent injury for runners and walkers. She is a published author of peer-reviewed research papers in the kinetics of running and walking. The La Vida v2.0 are very lightweight, under 6 ounces for a size ten women's shoe. But that doesn't mean that they are unstructured. I've worn many minimalist shoes that leave my feet feeling uncushioned and unprotected. The OESH La Vida v2.0 has an upper that provides protection and a patented sole that cushions and supports in ways different from any other running shoe. Dr. Kerrigan's design corrects the flaws she sees in the soles of other athletic shoes. They cushion at the point of ground strike, yet research shows that the twisting forces later in your stride may cause as much or more strain on your knees. The EVA foam in most athletic shoes doesn't "give" at the right points in your stride, and a built-up heel increases the twisting forces on your knees. The OESH sole starts with a sensory bar of dense and quick-responding material on the outside edge of the sole, to give you "ground feel." The response zone under the mid-foot also allows your foot to move throughout the stride. The floating arch provides the opposite of arch support, allowing your arch muscles to do the work rather than the structure of the shoe. These shoes do not provide traditional motion control or correction for overpronation. OESH shoes are designed with zero drop from heel to forefoot. The big athletic shoe companies are joining that trend, but you still see many shoes with a built-up heel. Walkers don't need a built-up heel as we are supposed to plant their heel first. Uppers: The mesh fabric of the uppers has enough heft to protect the foot The shoes are breathable. The construction around the ankle is cushioned enough for comfort. Style: The shoes come in four color combinations. The charcoal is a good basic style to wear all day and sneak out for a 15-minute walking workout on your break or a 30-minute workout during lunch. Room: The toe box was wide enough for most feet, even for people who usually need a wide shoe. Lacing: The lacing system is typical, with enough eyelets to do custom techniques. The tongue is padded for comfort across the top of the foot. Walking: The feel of the shoe is that the foot is protected, not naked as with many minimalist shoes, yet you can feel the ground with each stride. You can get a natural foot movement wearing them. As with any minimalist design, it's best to wear them for short periods at first and slowly build up your time in the shoe. However, a physical therapist noted that there was significant leaning inward of the ankles when the tester wore the shoes. However, that person had no aches or pains while wearing them for walks of a mile. These shoes are best for walks of 3 miles or less for most people. Above that distance you may find it better to wear a shoe with more cushioning. The OESH La Vida 2.0 is a lightweight/minimalist shoe that may meet the needs of many walkers and runners who have a neutral gait and enjoy workouts of an hour or less. The developers have published peer-reviewed research into human walking and running and the effects of running shoe design. If you have specific foot problems and pain, it is best to consult a podiatrist. Kerrigan DC, Franz JR, Keenan GS, Dicharry CU, Wilder RP. The Effect of Running Shoes on Lower Extremity Joint Torques. PM&R: The Journal of Injury, Function and Rehabilitation. 2009 Dec; Volume 1, Issue 12, Pages 1058-1063. What Did People Like About Reebok RunTone Toning Shoes? Are Your Walking Shoes Flexible Enough?